Event planners in Singapore usually rely on tentages to host outdoor events – reason being that tents are versatile, sturdy and highly customisable. They come in a wide variety of shapes, sizes, and designs that is suitable for different types of event logistics solutions. Moreover, tents come with a variety of add-on features that are functionally practical, to allow smooth management of the event. Here are some tent features that you need to know. As an event planner, an indication of good planning and business acumen is having events scheduled throughout the year, and not just during peak seasons. While the weather in Singapore will not always be consistent, one has to be resourceful in ensuring the quality of interior environment, despite whatever the exterior environment is. One way to achieve this goal is by ensuring that the internal temperature is being maintained at a temperature comfortable or suitable for the intended use. Whether you pick a high peak tent or a double storey tent, an effective temperature control system allows the temperature to be monitored and maintained within a specific range with ease. Depending on the type of event, some organiser don’t mind using an earthen or asphalt surface while others insist on carpeted type flooring. Event tent flooring can make the entire venue look spacious and cosy. Other than the usual colourful range of carpet, you can choose from a wide range of elegant floor styles – from exquisite wood tiles to premium synthetic grass. Moreover, you can redesign the layout with tables and chairs to harmonise with the selected flooring. Staging is also an essential portion for events, especially where there are performances or speeches to be made. Be it a T-shape runway or an elevated lounge area, the staging is another flexible element which can be freely transformed with a dash of creativity. Lighting has always been an important aspect for events. Whether it is a showroom by the day or an award ceremony in the evening, proper lighting can be utilised to create appropriate atmosphere and effect. When it comes to event logistics solutions, there are various type of lightings for different purposes – and you may be spoilt for choice. 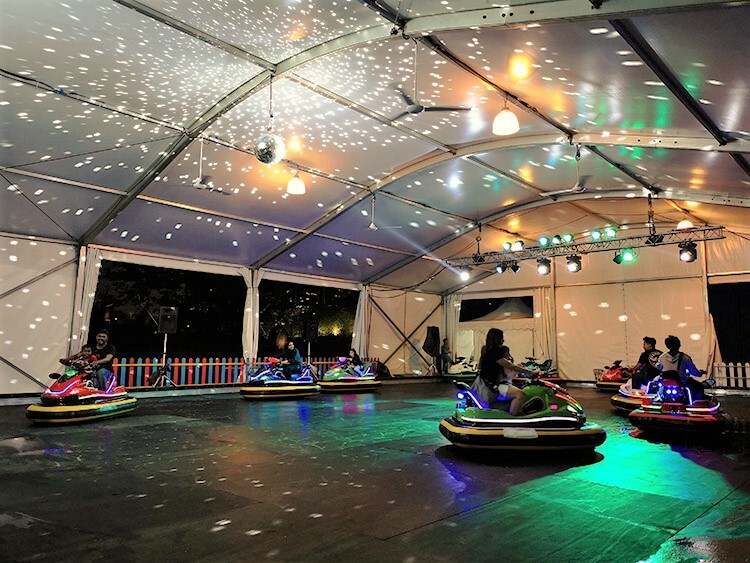 The best solution is to seek professional advice from the tentage rental company which you will be renting the tentages from, for they are in a better position to recommend according to the respective needs, in terms of usage, compatibility and availability. This will save the trouble of dealing with too many vendors and contact points. it’s a school function or farmers market, there’s no need to keep a dull, monotonous shade on the tent. How about creating a design that stands out so much that it becomes a reference point for location and discussions? cantilevers, and balconies which can be added to the tent structures to make the event a show-stopping one. To conclude, event logistics solutions have evolved from the simple tents with no features of the 20th Century to modern structures that have climate control, flooring and staging, lighting and customisable fabric constructions. Inquire from your tent rental company to find out how to customise your event using these features. Share the post "Useful Tent Features You Need to Know"